The W. M. Keck Cosmochemistry Laboratory, established in 2006, is a catalyst for interdisciplinary research into the origin of the Solar System. The centerpiece of the laboratory is a state-of-the-art Cameca ims 1280 ion microprobe, the latest version of the Cameca large-geometry magnetic sector secondary ion mass spectrometer (SIMS). This instrument is capable of in situ measurements of chemical and isotopic compositions of many types of natural samples at a spatial resolution of tens of micrometers down to submicrometer scales. Our cosmochemistry research utilizes samples of meteorites, interplanetary dust particles (IDPs), and samples returned from NASA missions, such as the Apollo Moon missions, the Stardust mission to comet Wild 2, and the Genesis Mission to capture solar wind. We are poised to utilize samples from future sample-return missions to asteroids, the Moon and eventually, Mars. The W. M. Keck Cosmochemistry Laboratory is open to researchers from around the world for collaborative research on cosmochemistry. 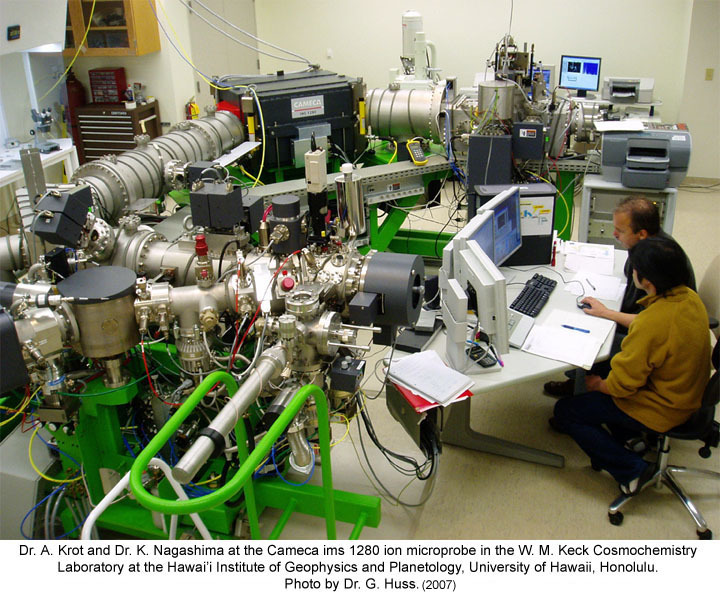 Funding for the laboratory was provided by the W. M. Keck Foundation, NASA, and the University of Hawai'i. Site updated: 16 October 2018.